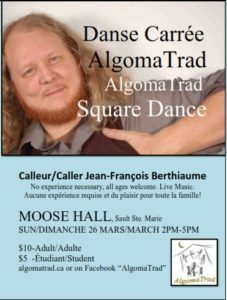 AlgomaTrad is holding a Family Square Dance at the Moose Lodge, 543 Trunk Rd, in Sault Ste. Marie, Sunday, March 26, 2017 from 2pm to 5pm. Caller extraordinaire Jean Francois Berthiaume, who was our featured caller for our Québecois music and dance weekend last year and has taught at the AlgomaTrad Family camp, will be there to get everyone stepping it out, in both English AND French. Music will be provided by members of The O’Schraves and special guests. Admission is $10 adults, $5 students, and children under 8 free. Click on the poster to download a a copy.